Small - 9"- 10" X Large - 12"- 13" Medium - 10"- 11" Large - 11"- 12"
Banyan Health Care Neoprene Tennis Elbow Support 3"
Neoprene Tennis Elbow Support 3" helps relieve elbow pain and tenderness. Designed to be used during activity to alleviate pain and inflamation. Easy to adjust with loop lock ring and hook-and-loop fastener(s) closure. 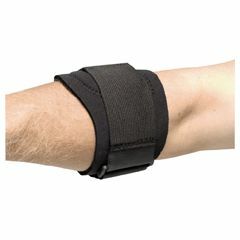 The 3" Neoprene Tennis Elbow Support helps reduce painful inflammation, and is designed with a pressure point pad that easily tightens with loop lock closure. *Measure elbow circumference for sizing. 225001 - Small - 9"- 10"
225004 - X Large - 12"- 13"
225002 - Medium - 10"- 11"
225003 - Large - 11"- 12"
A little snug, but it works good. Need one more size larger. Arthritic. Short Term User. Diabetic. Elderly. Works very well once it is in place. The largest size was just at the limit to fit my arm, which made it slightly difficult to get it in place. If not for that, I'd have given it 5 stars. Very good quality and comfort for the price.